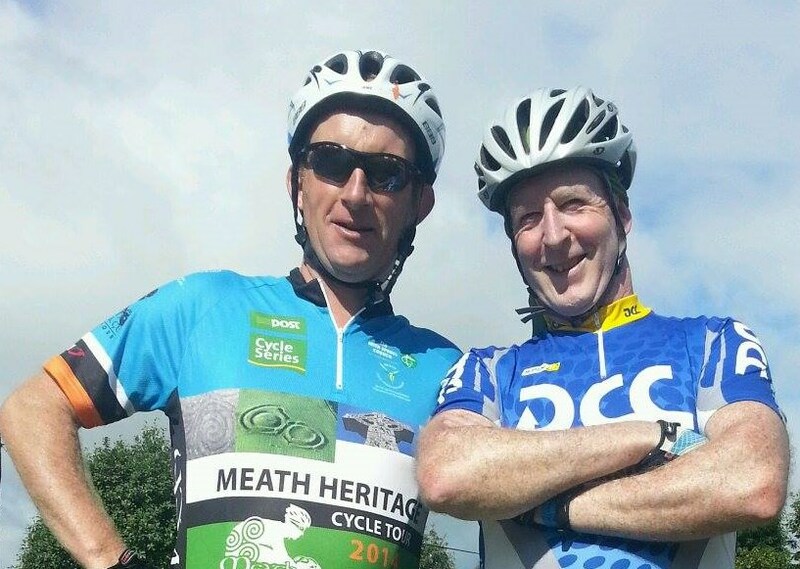 Tour of Meath, July 27, 2014. Since early July, I’ve clocked up the miles. Lots and lots of miles, amid glorious sunshine. I’ve done it right, as I increased my long-distance spins bit by bit and decreased my pace to match. Therefore, as I drove to Dublin on Saturday I was very enthusiastic about my first An Post Tour of Meath. I had previewed the route online and there was nothing there that would cause me any huge difficulty. 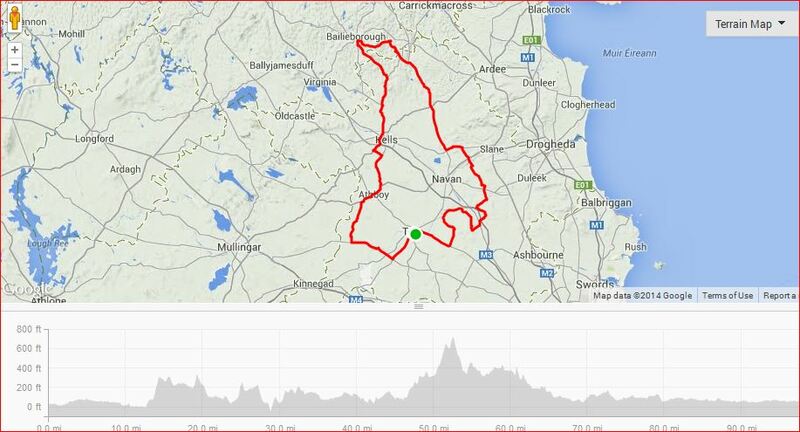 Having cycled the Vee and Knockboy last weekend, this route looked very flat, with only one small hill along the way. The atmosphere in Trim as I registered on Saturday evening was really good. The finish line was all set up, the PA way singing loudly, and there were many marquee events nearby. Of course, most notable were the many cyclists coming and going…but not a bike in sight! Registration was extremely efficient, and I was back behind the wheel within minutes to overnight in Dublin. Pasta & plenty fluids were the order of the evening, and I got an early night knowing that I needed to be on the stat line with my buddies at 8am. 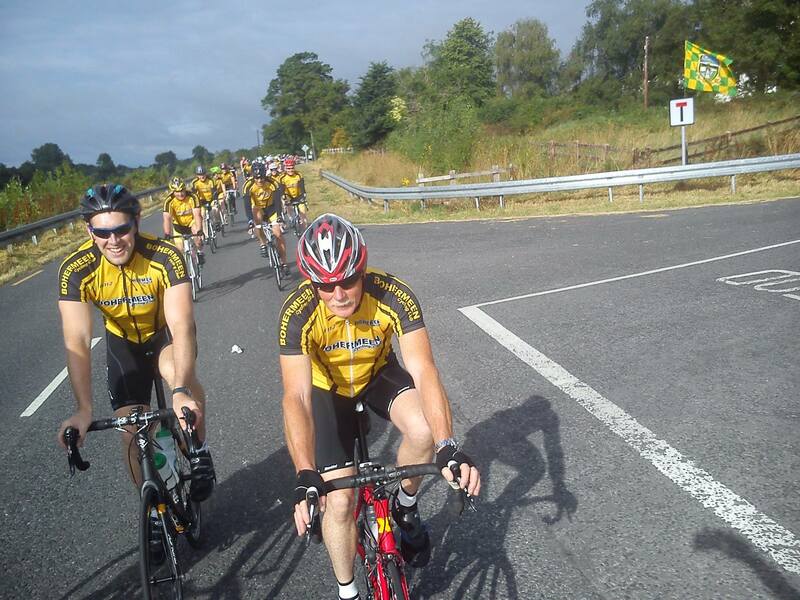 My buddies for this one were local man Francis Walsh, and Joe Lynch from Naas Cycling Club. As arranged, we met at the startline after several phone calls, ready for road. And at exactly 8am, we were counted down and sent on our way. for the first hour, as in any long 160k event, we simply rode steady pace in a very large group, estimated at 1500. It was impossible to try to move forward, as it just was not safe to do so. It became even trickier after 10k as we moved on to narrower local roads, heading towards Kilmessan and the famous Hill of Tara. The road here was very narrow, and as many ahead of us seemed to slow down, we moved up the bunch carefully. As the miles sped by, the groups splintered and we tried very hard to get into a groove. However, there was very little of real interest until we hooked up with Cuchulainn CC (Dundalk) They obviously had a plan. eight members in club gear at the head, working well, so we decided to sit in. Unfortunately, as soon as we hit a hard little hill, they did not stay together, and once again we went off in search of a group that might. We arrived at the 5okm water stop, and rested up, filled up and headed on again quickly. This time, we formed our own group. There were about 12 together, but usually buddies want to cycle beside buddies and no movement in the group means no momentum. Those at the front usually get tired, and those behind are chomping at the bit! Time to crack the whip! I spoke to Francis, and we got it moving. We went to the front, and after about three or four minutes, Francis went up & over, as I urged the guy behind him to move up. That got it rolling, and within minutes the pace was up, people were chatting enthusiastically with strangers, and before we knew it, we arrived together in Nobber (who thought it up?). Onwards than towards the Cavan border, and the road began to rise. I had known that it rose to 600 feet (not much really), over approximately 6 miles. Not a hill to be afraid of. However, Francis & I left the comfort of our friendly group and we pushed on hard. Then we pushed a little bit harder again! When we got to the top, approximately 10 miles from the next food stop, we decided to go steady, and immediately over-ruled ourselves. We got a good strong pace going, but by the time we got noodles & sandwiches, we noticed that the average had dropped from 17.2 to 16.9mph, largely because of the long hill. Farmers and retired teachers. What’s the world coming to, at all? Therefore, with full bellies and bottles, we headed onwards for the final 40 mile section. Flat, the stewards advised, and they were right. As soon as we had gotten back into a rhythm, we really opened up a strong pace in order to find that elusive group. The Gods were smiling on us, as we met fourteen Bohermeen CC warriors towing a group of about twenty behind. The Gods were not smiling for long, as the rain came down. Not heavy, but enough to make a bad drizzle, and greasy roads. This was not the time to be sitting at the back of the group, and we moved up when the opportunity arose after several roundabouts on the edge of Kells stretched the elastic. We sat in with the Bohermeen lads, and we did our turns. This group was a joy to be in. Everyone worked hard, everyone looked out for any members who might be struggling, and above all we chatted and had the craic. I spoke at length with Barry who is undertaking the Race Around Ireland in September. What a challenge! The miles ticked on, the pace stayed high, and the legs were beginning to feel a bit tired. No matter, we pushed on to Athboy and increasingly we had the tailwind for the first time since leaving Trim hours earlier. At the finish hands were shaken, shoulders slapped, and goodbyes said. The Bohermeen boys are coming down to Waterford in August for the next an Post event, a slightly tougher course through the Comeraghs. Needless to say, they’ll be welcomed, but won’t need much minding! The group is stronger than any of its members. Strong cyclists can cause havoc in a group. These lads understood, each and every one of them, that the lad who is very strong today might need a dig-out tomorrow! Outsiders are welcome. Once they saw that we were not just going to sit on the back, and we worked to keep the cohesiveness of the group intact, they let us in. They chatted, they put us on the front & they urged us on. In fact, at one point I was expecting a reprimanding roar from behind to steady the ship, but they seemed to know that it was ok to reprimand their own, but not the visitor! These lads were locals. They knew the roads, they’d biked them upside-down and inside-out. This is hugely important on an event like this, away from home and into the unknown. I think it would be a good idea to keep a watchful eye at the start line to find the locals. It worked for us today, even though it wasn’t until the latter end of the spin. Food, friends & flat miles. 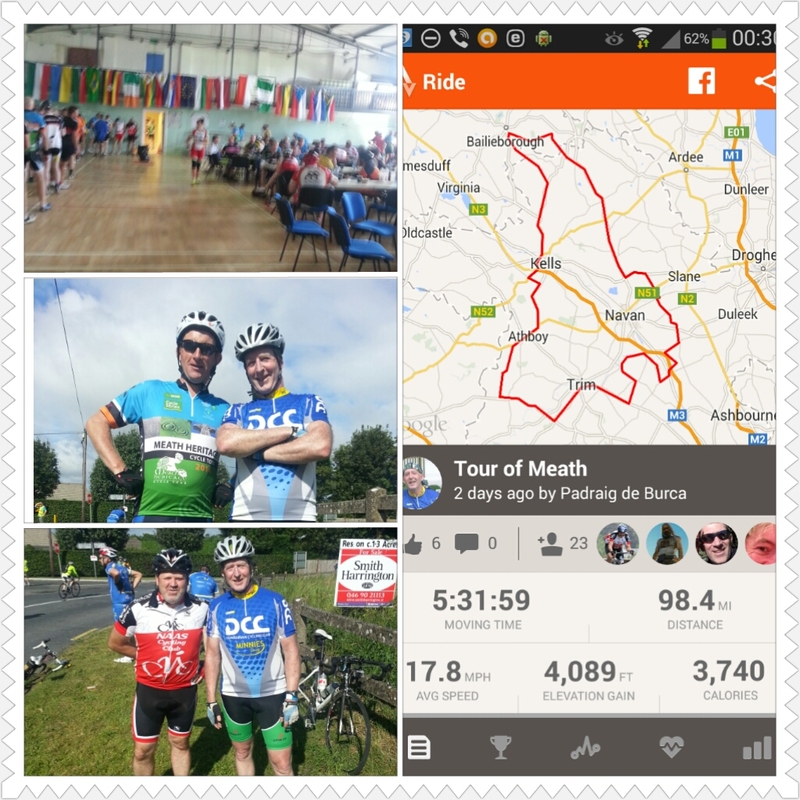 First Tour of Meath completed. The pleasure was all ours Padraig. Congratulations on a fine blog and your kind words on our club and county, I’ll post your link on bohrrmeen Facebook page, the guys will be really impressed. Keep up the good work and will hopefully see you on the road.